At the beginning of the week Maya died, just after the vet diagnosed a mild gas colic I recalled that Ttouch had bodywork techniques that I could do with Maya to help her resolve the colic. I came out one evening after work. 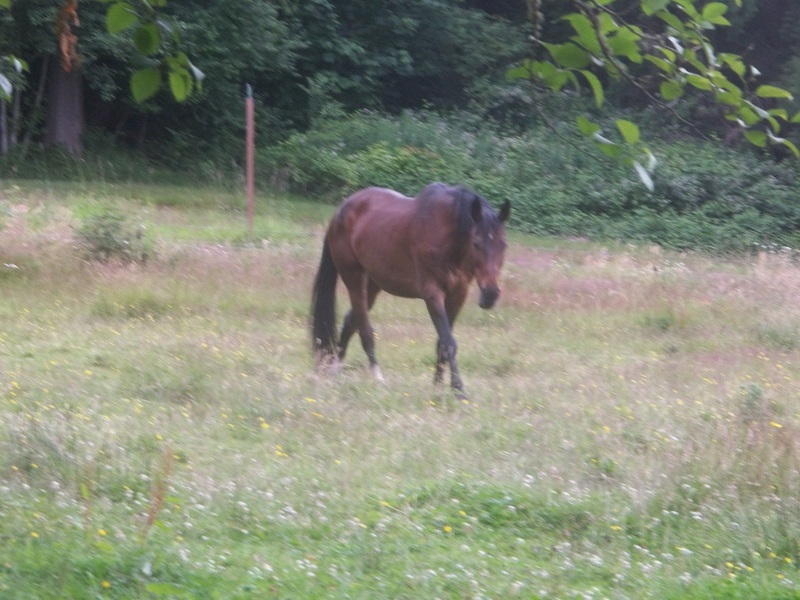 It was dark, and I walked into the field to see where I might find the horses. Before I got very far, my other horse came and found me, parked and asked to be itched. I itched away, and when I looked up, there was Maya waiting right behind him. I eventually made my way to her, and did the belly lifts with the towel described in the article below. She relaxed and cocked a hind leg. After a long time, when she had gotten what she wanted, she wandered off back into the field, the moon having just risen. I was glad that there was something I could do to help her feel better. 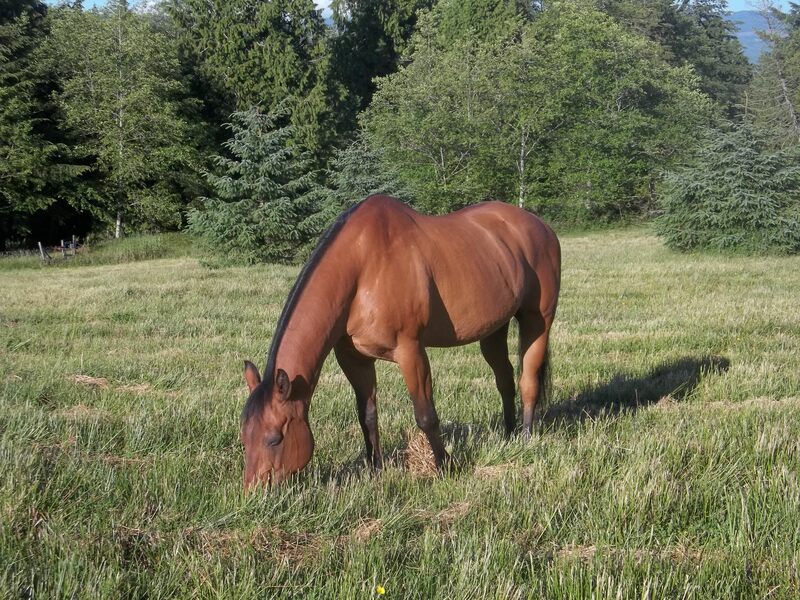 Rehabbing retired senior horses can easily become a full-time job. Being such large animals, the average horse weighs 1000 – 1200 lbs., and needs a lot of space. They eat 20 lbs. of hay per day and pass 10 manure piles per day. Everything about them is on a large scale. 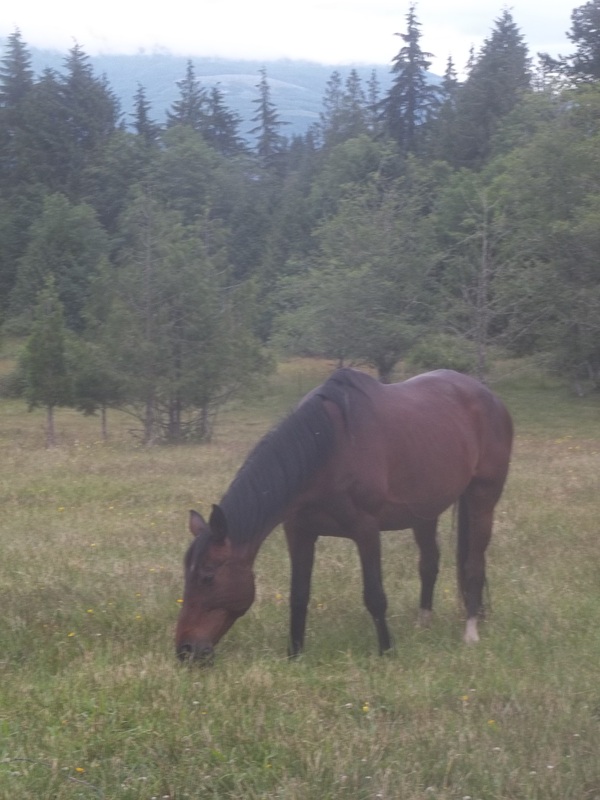 When a horse reaches maturity, they are incredibly powerful animals. It’s no accident that they talk about “horse power” in a car. Over the centuries they have done many jobs for humans, from farming and transportation to war. Today they’re even being used to help humans in emotional and physical therapy. They are so versatile, and can do so many things for us. Because of that, one important question is easy to overlook: Who are they? I recall a story of a woman who had been involved with horses for 30 years, riding different disciplines. Not until she took in a “grumpy” retired service horse did she realize she did not know what to do to help him. He was always unhappy, pinning his ears. Desperate to find a solution to his unhappiness, she stepped outside her box of 30 years and found a body work practitioner who had a different skill set. 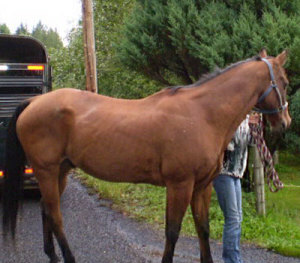 After this horse’s body work session she learned some techniques to do with him to help him feel better in his body. Over time, this horse’s demeanor completely changed. His happiness returned. He no longer pinned his ears. The experience changed her life. She said that in all of her 30 years of experience with horses, she never knew them, until now. A door had been opened into the world from the horse’s point of view. With everything horses do for us, whether riding or therapy work, it’s easy to forget that they are sentient beings who have their own horse life that is different than ours. The next time you see your horse, take a moment and pause in the midst of everything you need to do and just be. Experiment with a few minutes of doing nothing and just being in the presence of your horse. I’d love to hear what you learn. 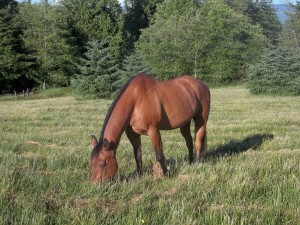 If a horse pins its ears, that is, lays them back against its head, what is the first thought that comes to your mind? Is he angry? Grumpy? Annoyed? Feels crowded? While we may make judgments about what we think the horse is saying, the fact is, we really don’t know for sure, and we don’t know why he’s saying whatever it is he’s saying. Solving this communication mystery, without judging the horse, will open doors to a whole new world. I recently did a horse camp for my 8 year-old niece, and before she got on to ride, I asked Chaco, my horse, to circle me at the walk a few laps each direction. He was responsive, so then I asked for the trot. The moment he picked up the trot he laid his ears back, and they stayed back. “They went back?” she asked. I sent him again a few laps each way, stopped and then walked over to my niece. So I sent Chaco in a forward walk a few laps each way, and then stopped and went back to my niece. With Chaco being 33 years old it was completely reasonable that the trot on that small of a circle was uncomfortable for him. The rest of the day went so well that when she went to leave, Chaco was so relaxed that he ignored his hay and kept both eyes on her. She probably spent at least 15 minutes saying good-bye and giving one more hug several times, and he welcomed them all. It was confirmation for me that she read him correctly when she stuck with the walk. 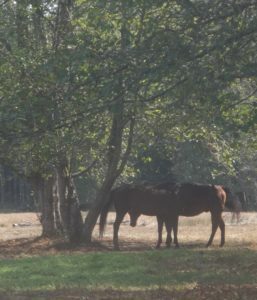 Because horses spend so little time talking with their vocal chords, it’s imperative to learn to read their primary mode of communication: body language. It’s a silent language, but so powerful. As you start to get the hang of it, a whole new world opens up. 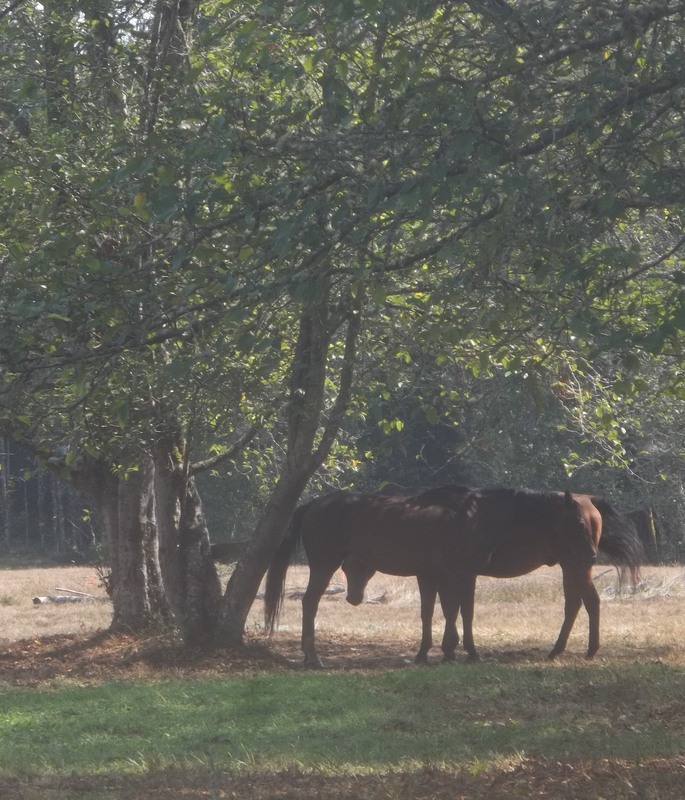 In my ideal world there would be no need for God’s Window Senior Horse Rehab. All horses that spent their lifetime serving humans would get to retire in full health and continue to thrive until they died a natural death. Unfortunately, this is not the case for many senior horses. By the time they come to God’s Window, they are typically run down emotionally and physically. All the decisions, whether good or bad, that were made about their care earlier in their life usually catch up with them, either to help them thrive or to bring about their demise. With my first senior horse, yes, he is still going and in good health. When he first came several years ago at the age of 26, everything fell apart in his first year of rehab. The second year he put his body back together. The third year he thrived. He continues to thrive today, and he is 33 years old. 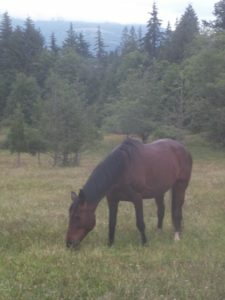 With my second senior horse, no, he died before his full health was restored. While we resolved his chronic diarrhea immediately, it took 3½ years for his coat to no longer be sticky. Arthritis set in in his last 1-2 years of life. Thankfully we found a joint supplement that made a difference, and we saw steady improvement over six months. However, we ran out of time. He died before we saw his complete return to full health. No matter how old your horses are, or what purpose they serve for you, take a moment and consider how you want their senior years to be. Decisions you make today about their living environment, exercise, hay quality, nutrition, dentistry, chiropractic and any other healing modalities will have a profound impact on their quality of life in their senior years. 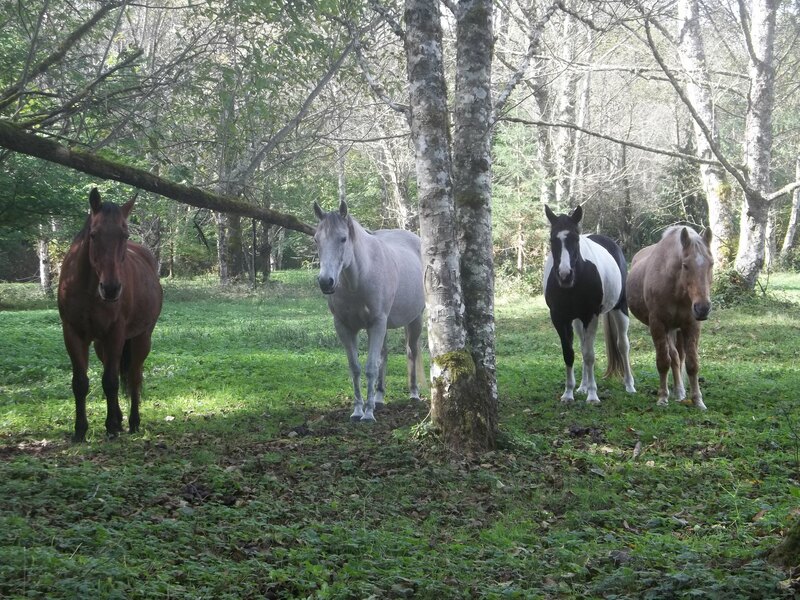 The good news is that given the right environment, senior horses can thrive in their golden years. You have the power to make a difference in your senior horse’s life today. If you need help with your senior horse, please contact us.